from 11am to 4pm Saturday February 13th. This year there are five race classes, including the Premiers Cup Challenge, the Ladies League and Class A big boats, Class B medium boats and Class C small boats. Everyone is encouraged to sign up and try their hand at racing in any class….the boats are there to be enjoyed. Food on the beach is tempting, music lively, games and fun for all. 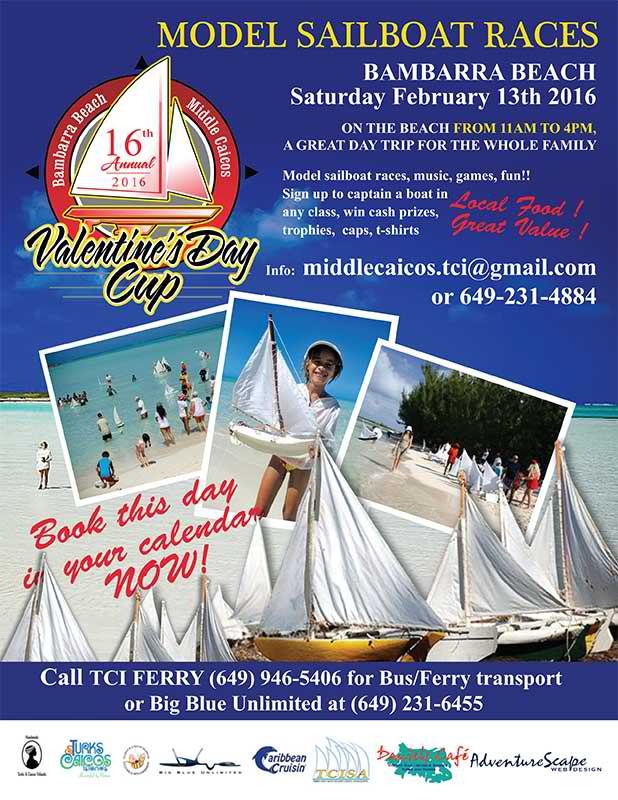 Check out the Facebook page or email middlecaicos.tci@gmail.com! To keep this tradition going, model boats are available for sale or donation to the fleet by sponsors- to date over 200 boats have been hand carved, raced and sold! The encouragement of the many individuals and companies that buy boats, race boats, care for the boats and stay involved is gratefully acknowledged.